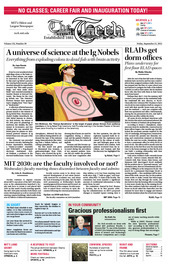 Eric Workman, the “Human Aerodrome,” is the target of paper planes thrown from audience members at the Ig Nobel Prize Ceremony, held Thursday evening in the Sanders Theater at Harvard. Paper plane throwing is a tradition at the ceremony. After the end of the first full week of classes, students have moved in and become comfortable in their assigned residence halls. Everyone has stepped into the flow of a new school year, and learned to navigate the halls of the Infinite Corridor as well as their suites. But do students know who else lives with them in their home away from home? The Tech recently sat down with retired MIT professor Woodie C. Flowers PhD ’73, one of the founders of FIRST (For Inspiration and Recognition of Science and Technology) Robotics Competition and a recipient of many teaching awards while at MIT.